Coverage: Radio commentary on BBC Radio 5 live (build-up from 14:30) and live text commentary on BBC Sport website. Highlights on BBC Two at 19:30 GMT. England head coach Eddie Jones believes "warrior" co-captain Owen Farrell does not get the same protection from referees as other fly-halves. Farrell picked up a hip injury in Saturday's win over South Africa but is fit to play New Zealand this weekend. Jones suggested the 27-year-old is treated differently because he plays through pain, while hits on Ireland's Johnny Sexton are blown up. "If he was Sexton then we'd be able to complain about him," Jones said. 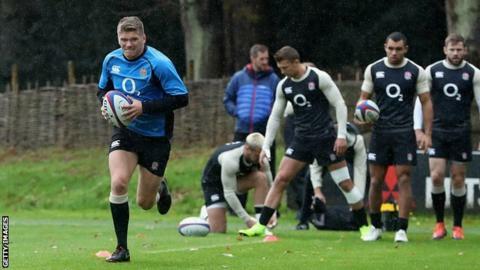 "But because he's Owen Farrell he's allowed to be hit late. He's tough so he gets up and he plays. "He's a tough rooster, a warrior. He takes the ball to the line, he puts his body on the line, he doesn't play in a dinner suit." Out-kick them? Isolate their backs? How do you beat the All Blacks? Farrell's physical approach has been questioned following his controversial injury-time tackle on the Springboks' Andre Esterhuizen last weekend, for which he avoided any disciplinary action. The Saracens fly-half has taken part in tailored fitness sessions this week but will face the All Blacks at Twickenham. "We manage him every week. Players like him are never 100% right. They get on the field, they play and they give you everything they've got and he's like that," Jones added. "He wants to play every week. If we are playing marbles on a Wednesday, he wants to play. He's a competitor. You can't put blokes like him in cotton wool."